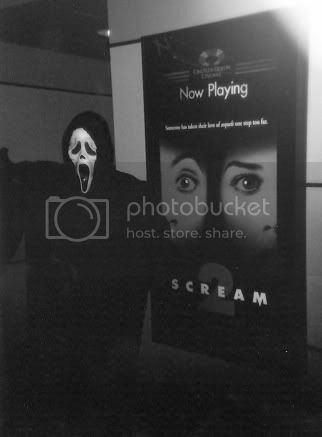 In addition to donning the bat costume earlier that year for the premiere of Batman and Robin, I was also tapped to play Ghostface from the Scream series in honor of the premiere of Scream 2 in December ’97 when I worked at the local Cineplex Odeon Theater at the Menlo Park Mall. My coworkers were aware that I was a huge horror fan as well as completely obsessed with the first Scream film. Electing me to stalk the popcorn gorging, giant soda drinking filmgoers while threatening that that I’d “gut them like a fish,” was a given. Compared to spending 6-8 hours shaking hands and sweating in the hot, awkward bat costume, I took much pleasure running around in the free flowing, comfortable Ghostface costume. Stalking theatergoers with a fake knife and sneaking up on unsuspecting girls coming out of the bathroom became my pastime for the evening. 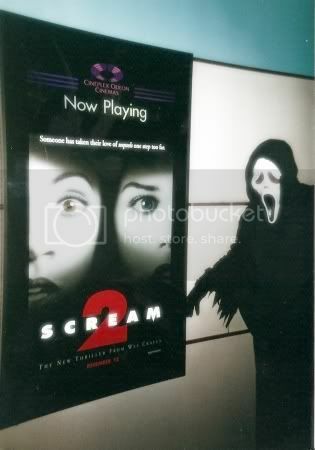 The most memorable part of being Ghostface happened during each presentation of the film. Right after the moment Jada Pinkett has her excessively dramatic death scene in the film within a film STAB, the Scream title slashes onto the screen. During the short fade to black, a theater usher slammed through the emergency exit door and up the aisle in the dark theater as if he was being chased. Seconds later, wielding a knife high above my head, I barreled through the door and sprinted up the aisle after him. When I reached the door to the lobby I blasted through it and had a laugh with my fellow employee, Victor. In the fleeting seconds that the stunt took place, I remember feeling quite a rush as I heard almost the entire crowd scream and gasp in shock and fear. What made the occurence even that much more clever was the fact that that part of the movie featured a “film within a film,” which blurred the lines of fiction and reality. I like to believe that my performance magnified that idea and added a little more thrill to the atmosphere. Would you expect something like that to happen when you’ve spent nearly 10 minutes immersed in a film that you payed $8 bucks (at the time) to see? Nowadays anything that can be classified as an “interruption” would start a line of 12 people complaining in attempts for free passes. 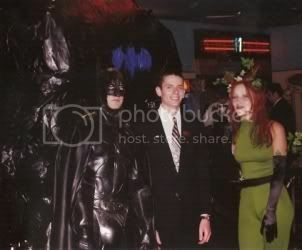 As I noted in “The Day I Got To Be Batman” I give credit to the Cineplex Odeon theater staff for taking liberties and being creative as film exhibitors. It’s not everyday you walk into a movie theater and see a cavernous homemade Batcave erected or a knife wielding killer from a horror film chasing innocent ushers through the theater at high speed. I would’ve liked to have been one of the people watching Scream on that Friday night. It was almost a throwback to gimicks like “smell-o-vision.” I would love movies to become more of an event, like when I go to see an film in IMAX. Do you think witnessing the killer chasing someone through the theater would intensify your viewing experience? Maybe if it doesn’t succeed at creeping you out, it would definitely make for a memorable bit of conversation! I cannot believe you actually have something this cool in your house! I was fortunate enough to snag this amazing customized Batcave last year from the Iron-Cow Productions store on eBay. The Batcave playset utilizes a custom version of the ’89 Batcave playset from Toy Biz and also features a custom Joker card and giant penny from Batman’s Trophy Room. 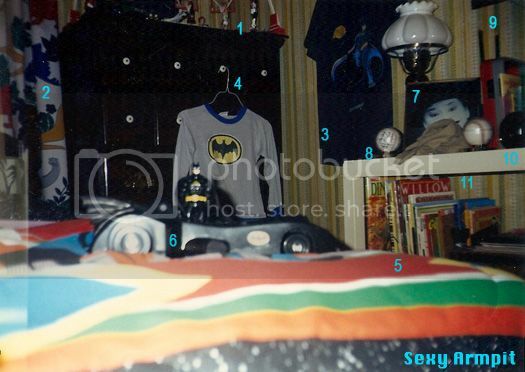 Naturally, this custom Batcave is one of the highlights of my Batman collection. And YES, it takes center stage in my bedroom! You could imagine how many “40-Year Old Virgin” jokes I get even though I’ve got a while to go before I reach 40! The man behind Iron-Cow Productions is Matt Cauley, who has grabbed the attention of the industry by showcasing his amazing custom action figures, and illustrations. 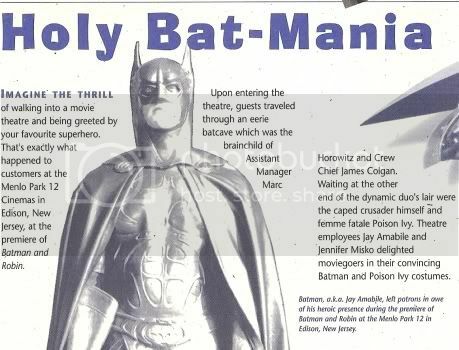 Matt is a featured contributer to ToyFare Magazine, and he also designed various DC Direct, Battlestar Galactica, and Marvel Comics Minimate action figures. In honor of the Dark Knight countdown Matt “Iron-Cow” Cauley granted me an interview to talk a little bit about what’s going on with his company and how he feels about the premiere of The Dark Knight. The Batcave playset pictured here was created by Iron-Cow Productions, after all the different properties from Marvel, DC and other companies you’ve customized for do you have a favorite universe or character to work on? Well, I’ve been a Batman fan all my life, so I’m naturally drawn to him. He’s what got me into comic books and since I drew him so many times as a kid, he’s the character on whom I really developed my art skills. In fact, the earliest surviving piece of Matt-art is a picture of Batman. Batman is easily the character that I’ve customized the most. Black, blue, animated, artist-specific, stylized… no version of the character seems too obscure for me to purchase for my collection, or for me to customize one of my own. You’d think I might get tired of customizing Batman over and over again, but I really have a blast with the character and love all the various interpretations.At least by staying primarily with one character, it gives me a lot of focus. This might explain why all my Doctor Who projects never get finished. With that line there are simply SO many characters I want to make, I’ll start on a new one before finishing up any already started project. Whether it be illustrations or customizations, do you have any dream projects you’d like to work on? It’s funny you say that. With the DC Minimates line, I was able to combine both my love of toys and illustrating. The S.T.R.I.P.E. Minimate was based off not only my control art, but if you remove the chest piece, you can see my illustration as well, in the form of his inner cockpit. That was definitely a fun project, creatively speaking. And, since I’m *such* a Batman fan, getting to help design a DC line really was a dream come true! Hopefully the Doctor Who Minimates will see the light of day. Ever since I was a kid, Batman and Doctor Who were my two biggest passions, and to have the opportunity to design toys for both lines? Seriously, that is my dream come true. Are you looking forward to The Dark Knight? 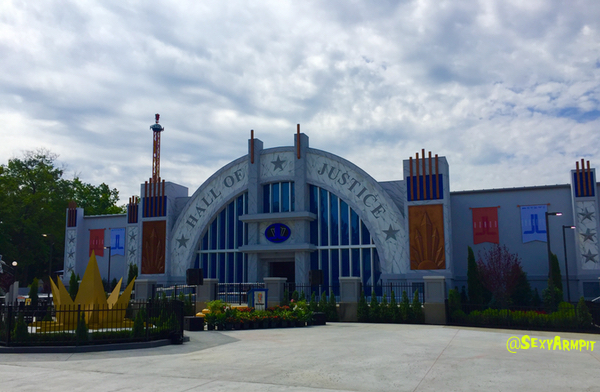 That opens soon, right? I might catch it at some point. In reality, my wife and I are checking it out Friday night. Can’t wait! Obviously, I don’t know more than anyone else out there, but I have such ridiculous high hopes for this movie. I seem to remember the website TheOneRing.net having a countdown clock for when “Fellowship of the Ring” was to be released. I found myself obsessively checking that, and then unintentionally counting down the days in my head. 12 months, 6 months… 25 days, etc. The website Batman-on-Film.com has a similar countdown clock, and it feels like I’ve been counting down the days to Dark Knight for as long as I can remember. After this Saturday, though, it’ll be interesting to see what is next in line to obsess over. Sure, there’s Iron Man 2 and the Avengers, but for me I need to know when Batman 3 is in the works! What are some projects Iron-Cow is working on right now? Most of what I’m doing these days isn’t toy-related at all. I’ve been contributing art to the GREENDOG and EPIC THREADS fashion line that’s exclusive to Macy’s. That’s definitely been an interesting project, as they allow me so much creative freedom. Walking into a store and seeing my art hanging there on the rack gets me grinning from ear to ear. I’ve also been putting together a huge series of portrait paintings for an art show later this year. One of these should be appearing in the upcoming ‘Eye Candy for Strangers’ coffee table book, so look for a sneak peek this summer! 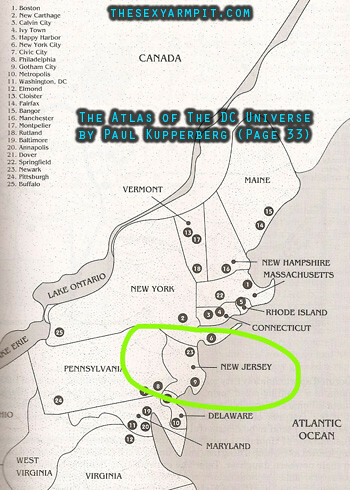 If someone was insulting New Jersey would you go along with them and come up with zingers of your own or would you defend the honor of Jersey and explain all the reasons why it’s great? Either way we won’t hold it against you! Now WHY would anyone insult Jersey? Now, Texas, on the other hand… you do NOT mess with! Wow, Matt is even designing art for clothing lines! And he’s comical too. He was obviously being funny when I asked about The Dark Knight and he replied “That’s opens soon right?” Haha! You can check out Matt’s work at http://www.ironcowprod.com/! He’s got a great Michael Keaton/Batman customization posted there among a TON of other great stuff. Be sure to look out for his customized figures, illustrations, and free downloads to help with your own customizations! When I was 16 I applied to work at the local Cineplex Odeon Cinema at the Menlo Park Mall. (Cineplex Odeon is now AMC Theaters) I knew it would be the perfect job for me especially since I was in high school and didn’t want a job where I had to be too serious or have too much responsibility. Without even realizing how fast the time went I wound up working there for about 5 or 6 years! I met so many awesome people throughout that time and saw a ton of movies. Sometimes on a Thursday night we would have screenings of the big films that were coming out the next day. I remember getting sneaks of all the cool movies especially for all the Star Wars re-issues and The Phantom Menace. I have some great memories of that place. For the first 2 or 3 years I worked there the management was very supportive and excellent to work for. One busy night at the theater in 1997, Bob, the house manager, pulled me aside. I got a bit nervous. Bob was easy to get along with but he was nothing but business. He wasn’t smiling so I thought something was wrong. JAY: “Did I do something wrong, Bob?” I always ask that of all my bosses…I just like the sound of it. F–k Jean-Paul Valley! What an opportunity for me since I used to pretend I was Batman for the first 16 years of my life and now I could actually be him in front of people. 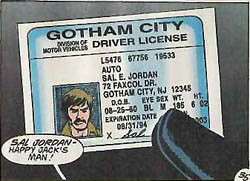 I definitely felt like I was a shoe-in for the job because everyone there knew I was the resident Batmaniac. When I put on the cowl and cape, such a familiar feeling came over me as if I had put on a cape and cowl every day of my life. I did my best impression of Michael Keaton when he became Batman. Screw Kilmer and Clooney, I was still a Keaton mark! Not only did they get one of the more professional looking bat costumes for me to wear but they also had a few members of the management team create an overhang above the ticket ripper that made you feel like you were entering the Batcave!